This degenerative disorder is a form of mental dementia. It used to be called senility, now called dementia, it is characterized by problems with remembering, reasoning and cognition (thinking). Alzheimer's Disease was first identified in 1907 by a German neurologist named Alois Alzheimer, it is characterized by a progressive failure of mental functioning, including loss of the ability to communicate or concentrate, accompanied by personality changes and mood swings. It seems to affect a person's ability to remember small things at first; but usually comes to include physical functions as well. These begin with such things as bowel and bladder control, and can grow to include an inability to walk or even move. Symptoms of Alzheimer's are gradual memory loss, difficulty performing tasks, impaired judgment, disorientation, personally changes and difficulty communicating. People diagnosed with this disease can experience different symptoms and may not have all of these. It may be a decade before symptoms show up. Genetics may also play a part as scientists have found an abnormality on two chromosomes may be responsible for the early onset of this disease in certain individuals before they are age 60. The more common form of Alzheimer's has been linked to a chromosome called Apo E-4. This is a risk factor not a cause. You don't necessarily get the disease from having the chromosome factor. Because nothing is conclusive concerning genetics, it is not used to diagnose this disease. The cause of Alzheimer's was, for a long time, a mystery. It is a brain nerve disorder. What is known is that the nerves of the body transmit messages very rapidly. In order to do this, the messages must bridge across the gap between the ends. As they do they emit chemicals called neurotransmitters. These serve as messengers that allow the messages to be transmitted and received by each nerve. A person with Alzheimer's Disease has had these transmitters broken down. One sign of this are sticky clumps that form between nerve cells. This is a protein known as Amyloid. Doctors call these clumps Amyloid plaques. We also now know that another problem, that contributes to this condition, happens when nerve fibers that surround the hippocampus, that portion of the brain which is responsible for transmitting memory impulses along various channels, become tangled and choked off. These twisted protein fibers are known as tangles. When this happens, the impulses that carry familiar information are not recognized by the receptors or the motor responders. Thus, the information that comes in is not perceived as memory and no new patterns are formed. The older patterns of impulses become less available because they can not be recognized or retrieved. The condition, then, of tangled nerve fibers is the one to consider. What causes that? Studying the tangled fibers, scientists have found these Amyloid plaques, proteins called beta-amyloids, form around these damaged nerve cells. As time progresses more and more nerves are damaged and eventually die. As a result, there are decreased levels of certain neurotransmitters specifically one called acetylcholine. From this lack of this neurotransmitter the nerves lose their ability to communicate. In order for the nerves to repair themselves properly, they need adequate nutrition. Much of the processed food we eat today robs the nervous system of its important chemical balance. Compared to the general population, a significant number of Alzheimer patients suffer from a lack of zinc and vitamin B12. As you may know, the B vitamins help to maintain the delicate balance of nerve health in the body. That's why our mothers told us celery, which is particularly high in B vitamins, was "nerve food." B Vitamins are water soluble. Which means they will be absorbed into the body as long as they are present in the body and then washed away with water as it is leaves the body. That is why sustained released Vitamin B complex is your best bet for maintaining a presence of B vitamins in your body. It allows the B vitamins to remain in the body longer because they are coated and thus not not recognized as quickly as waste. A complex is best because many of the B vitamins work together. Elderly people are more prone to this disease due to the combined problems of poor absorption of proper nutrients into the cells of the body, and the lack, in many older people, of proper meals to begin with. Thus these deficiencies can occur. With normal aging, our brains are likely to shrink some, with a few cells deteriorating over time. This shows up as slower brain functioning. Alzheimer's, on the other hand, is a different process. Where plaquing occurs in the brain will show what functions have become impaired. Normal aging shows some lapses in memory with retrieval of information some time later. In early stage Alzheimer's memories of the most recent events such as in the last few hours days or even weeks completely disappear. Some symptoms of early on set could be difficulty reasoning, language problems such as finding the right words or diminished vocabulary, a loss of smell specially things such as leather, natural gas, lilac, clove, menthol, pineapple, strawberry soap or smoke, sometimes they might loss initiative to participate in activities and want to sleep more or watch television. Because some of these early signs can be caused by depression, it is important to use tests and testimony from those who know a persons routine. A person exhibiting two or more of the above early signs should be evaluated to rule out other problems that can mimic Alzheimer's. Diagnosis of anyone suspected of having Alzheimer's Disease is done through personal information gathering from those friends and family members that might have pertinent sharing about the symptoms of the person. In addition blood tests and brain scans are done to rule out other conditions such as strokes or brain tumors that could be causing the symptoms. These scans may now include tomography (CT) and magnetic resonance imaging (MRI) which will be used to ascertain any loss of brain tissue and/or impaired or lowered brain activity. If these scans are still in doubt then position emission tomography (PET) or single photon emission computed tomography (SPECT) can be done. Other tests also certain cognitive tests can be done to see which areas are affected and possibly how far the disease has progressed. Tests such as block tests and drawing are used to determine the person motor skills and coordination abilities as well as motor memory and identification skills. Each person is affected differently so what is done fro treatment depends upon what each person needs. Physicians that may need to be consulted may include internists and family physicians and some people may need to consult with certain specialists like neurologists that deal with brain disorders and nerve information, Psychiatrists and/or psychologist that deal with cognitive and reasoning abilities, geriatricians that deal with diseases in the elderly. Any person that has been diagnosed with Alzheimer's Disease and who is not on medications depending on how far their disease has progressed should be seeing their physician at least from one year to six months. Persons who are being treated for the condition and are on medications should be seeing their physician at the very least every six months to three times a year. Other family members and friends may need to meet with sociologists, nurses or social workers. They will need to explain what may need to be considered so that those who can eventually make discussions for them and who want to, can have the power of attorney to do so. You may need to make a living will that allows others the freedom to handle choices that need to be confronted about your medical condition. Financial issues need to be considered and you may find that you need to meet with an attorney or financial adviser to work out all of these details. Safety needs to be considered. Can this person call for help should they need it? Can they operate appliances well enough to be safe? Is there an emergency plan in case their primary care giver is not able to be present? Is your primary care giver a family member or friend or a professional care giver? The primary care giver may need support to cope with stress as this can be a very physically and emotionally draining. The primary care givers physical needs have to be met as well. Support groups for those with this disease and their care givers are very important. You need to avoid isolation and feeling alone. Be honest from the beginning. Right from the start tell family, neighbors and friends so they can know how to best support you. Welcome any help they can and may care to offer. 7 out of 10 people with Alzheimer's Disease are living in a home with family and friends and being cared for by them. Additional research has shown that Alzheimer's patients have a higher concentration of aluminum in their brains, than do the general population. it seems that exposure and intake of excessive amounts of aluminum, combined with vitamin and/or mineral deprivation, can lead to a person's becoming predisposed to Alzheimer's Disease. How does one become exposed to aluminum? Cooking in aluminum pans and eating and drinking from aluminum containers are the most common ways! Other chemicals are also considered to contribute to this disease. Mercury from amalgam, the alloy used in much dental work, is a prime suspect. Many researchers say that beta-amyloid is an important contributor to this as well. Beta-amyloid is not, itself, a toxic substance; it is a by-product of dying tissue in all parts of the body. When high accumulations of this substance build up in the brain, the onset of this disease may begin. Another important factor is the lowering of the effectiveness of the body's own immune system. Because of the imbalance of nutrition, proteins called complete proteins tend to accumulate around the plaques of the brain. It is a strange cycle; the amyloids then trigger the release of more complete proteins. The rule here is not to fight off the disease; it is to bring the whole system into order through proper absorption and nutrition. Finding out how to ride the brain of too many complete proteins that it is not utilizing and ensuring that Beta-amyloids do not begin to build-up in the brain to begin with are the issues to address. Recent research has shown that the dietary products that contain Aspartame can also contribute to the conditions associated with Alzheimer's Disease. Aspartame is a synthetic chemical composed of two amino acids, phenylalanine and aspartic acid. These combine with a third chemical known as methyl alcohol (also known as methanol or wood alcohol). The higher levels of phenylalanine, when ingested from sufficient amounts of aspartame, increase the toxicity of the blood going to the brain. Too much phenylalanine can interfere with the production of certain neurotransmitters in the brain. This can even lead to overstimulation of certain populations of nerve cells in the brain, possibly causing their destruction through over activity. D-aspartic acid tends to accumulate in the aging human brain which could have a significance in Alzheimer's Disease. Methanol is synonymous with wood alcohol, which is a deadly poison even when consumed in relatively modest amounts. Wood alcohol consumed by the body in any extended quantity acts as a toxin and is responsible for killing off nerve cells, brain cells and lowers the bodies immune system. Extensive Aspartame consumption has been readily reported to have brain dulling effects over some period of time. A caution in diagnosing Alzheimer's is to be aware of the affects of aspartame being mistaken for the disease. Knowing that proper nutrition is essential, is a good first step to avoiding or minimizing the effects of Alzheimer's Disease. Becoming aware of mercury, aluminum and aspartame sources is another. We not only want to avoid ingesting these substances; we even want to minimize skin contact with mercury and aluminum, since absorption of these can also take place through the skin. Aluminum containers, even those coated with wax, which are used to house certain juices, can cause the juices inside them to be higher in aluminum content. Foods, alcoholic beverages and sodas in aluminum cans may also absorb various quantities of aluminum. Aluminum cookware can double your body's aluminum content! 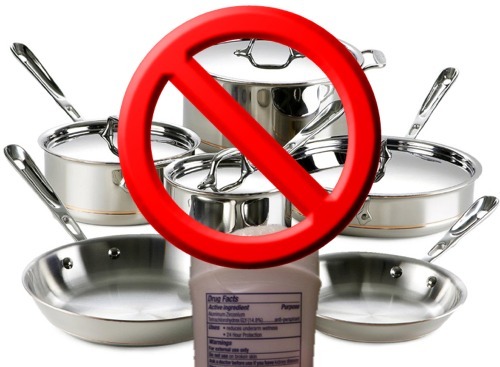 Think twice before cooking with aluminum pots or pans, or those that have exposed parts containing aluminum. Cooking and eating utensils containing aluminum should also be avoided. Storing foods in aluminum foil. Although the storage process is minimal, cooking in aluminum foil sometimes producing the response of the foil to stick to the food and then it is consumed. Once again we are talking about the possible accumulations over time. Shampoos that promise to handle your dandruff. Many of these contain magnesium aluminum silicate. Other shampoos may contain aluminum lauryl sulfate. Always read the labels before you buy the shampoo! these can be absorbed into your body through the skin and hair. Some commercially packaged douches contain aluminum salts. These can transfer to the blood stream in some cases. Most antiperspirants contain aluminum chlorhydrate; so do some skin powders. Several anti-diarrhea medications contain aluminum salts, including Pepto-Bismol liquid, Kaopectate and Rheaban. Antacids such as Di-Gel Liquid, Gaviscon tablets, Gelusil liquid and tablets, Extra Strength Maalox, Mylanta and Mylanta Double strength liquid and tablets, all contain aluminum hydroxide. Buffered aspirin, such as Bufferin, Ascriptin, Vanquish, Arthritis Pain Formula, Cope, and Arthritis Strength Bufferin contain aluminum glycinate and aluminum hydroxide. If you have been cooking with any aluminum cookware, please consider switching to something without aluminum. Alzheimer's seems to be a number one problem associated with an overexposure to aluminum...and who knows what other, less noticeable problems there may be? We find that Vision Ware and Pyrex cook evenly and contain no metallic parts. I use stainless steel or plastic utensils for cooking. Some aluminum pans have non-stick coatings that wear away or scratch, leaving the under-surface exposed to the food you are cooking in them. There are alternatives! Now, getting the excess aluminum out of your life doesn't need to be done in a frenzy. Yes, you need to replace your cookware and utensils as soon as possible if they are old and show signs of transferring to your food. But, how dangerous is the aluminum in one bottle of shampoo? Can't you at least finish the bottle? Well, you can...and you can't. Do you know your present level of aluminum? If it is already high, you probably don't want a single additional molecule. On the other hand, if you do not cook with aluminum cookware or drink from aluminum cans, you can probably finish your present bottle of dandruff shampoo without harm...but I wouldn't advise you buy another one! Having information about a product or anything else creates in us a sense of knowing what we need to do next. Be careful not to turn it into a "witch hunt" where you end up picketing the store that sold the product. Allow people the right to be responsible for themselves, just as you want for yourself. Knowing what a product contains is just information; and educating works far better than taking a stand against others who are just offering products that are requested by the public or at very best marketed well. If you feel you need to take action when you find an aluminum containing product, write the company a concerned customer letter. Base it as "just giving information and thought you'd be interested to know." Become an aware consumer and make the choices for yourself. For women who want to feel fresh all day, a good substitute for commercial douches is good old vinegar and water. Smelling nice, having a neutral or pleasant order or non-offensive one is important, I know from experience! A humid day can make one sweat profusely. There are a lot of deodorants and antiperspirants being sold today; one that increases the aluminum content in your body may make smelling nice be a moot point in the long run. When you use an antiperspirant with aluminum chlorhydrate, it is not only absorbed through your pores, it is breathed directly into the brain through your nose! Snorting some substances have a longer-lasting debility to the body. Stick to deodorants, which do not have aluminum chlorhydrate, and prefer gels to powders. If you need an anti-diarrhea medicine, use one that does its job without aluminum, such as Imodium AD. Aluminum-free antacids are available; some are Alka-Seltzer, Alka-Mints, Di-Gel Tablets, Maalox caplets, Mylanta gel caps, Rolaids tablets, Titralac and Tums E-X. Just watch the amounts that you consume and try to avoid those products that contain aluminum. Read the labels of all foods you purchase. Various baking goods and cheeses tend to contain or be higher in aluminum in some forms. Baking soda can contain as much as 5 to 70 mg. of sodium aluminum sulfate. Other aluminum compounds are used to thicken or modify foods we buy almost everyday. Fast foods are particularly guilty of this, mostly from the processed cheeses they tend to use. Aluminum is added to increase the cheese's ability to melt more smoothly. We can also predispose ourselves to this condition by our patterns of thinking. Over a period of time we find ourselves clinging to old thought patterns. Before long our bodies act on these accordingly. Louise L. Hay, in her book You Can Heal Your Life, says that the probable cause of Alzheimer's Disease is "a desire to leave the planet. Inability to face life as it is." She suggests reiterating the phrase, "Everything happens in the right time-space sequence. Divine right action is taking place at all times." The book also states that the probable cause of aging problems stem from "social beliefs...old thinking...fear of being one's self...rejection of the now." New thought patterns that we can foster are, "I love and accept myself at every age. Each moment in life is perfect." She suggests that the probable cause for senility comes from "returning to the so-called safety of childhood. Demanding care and attention. A form of control of those around you. Escapism." She suggests cultivating the new thought pattern of, "Divine protection. Safety. Peace. The intelligence of the universe operates at every level." These are just some of the things a person diagnosed with this disease can repeat to help restructure his or her way of thinking. This can then assist one to be, at least, more at ease. In her book The Body Is The Barometer of The Soul - So Be Your Own Doctor by Annette Noontil, the author addresses senility, which is referred to as Alzheimer's Disease or growing old at an early age. Annette states that these conditions are exacerbated by a feeling that "No one wants to communicate with you, so why bother communicating at all?" She also makes reference to growing aged in our thinking as "you do not want to be in the situation that you are in, of not knowing what to do with your life" and "not willing to stand up and change your life". If you should have one of these states of mind, it is easy to see that you just need to state your willingness to stand up and change your life for whatever is best for you. It requires a sense of self and a willingness, as well, to move beyond being the effect of others' views and your communication with yourself and others. I have found that there are a number of foods that help boost the brain's ability to function at peak efficiency. I eat many of these myself. One I take daily is called coenzyme Q10. It helps the cells involved in the body's oxygenation process, and assists the cells to produce energy for themselves. Lecithin is said to help increase memory. Some people take it to counteract the effects of arterial wall buildup. All the B vitamins (which should include Vitamin B15 in a high enough dosage) assist in keeping you sharp and cognitive. 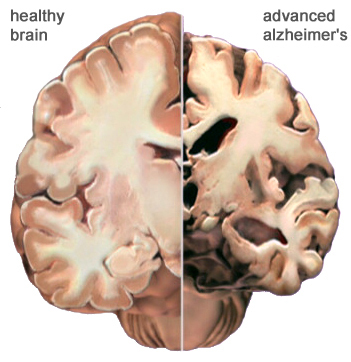 Zinc is one of the first things that gets depleted as Alzheimer's develops. Make sure you are taking enough of it! It helps stop amyloid plaque formation. Here is something not everyone knows about Vitamin C Complex: It is made up from a natural form of Vitamin C extract, not orange juice (which loses its C potency almost as soon as you open the container). Natural forms would include rose hips or other foods that contain high potencies of C. The complex form is the most effective in oxygenating the blood and brain. It contains other elements such as bioflavonoids, rutin and hesperdin. You want to make sure that this complex is buffered and time-released. As Vitamin C is a water soluble vitamin and can end up mostly being washed out of your body otherwise. Vitamin E Complex is another important food substance that oxygenates the blood. Although only the alpha tocopherol form of it has been tested (and shown effective), this gives no reason to take only alpha tocopherols, in my way of looking at it. I take the whole complex of Vitamin E. This is what is called mixed tocopherols. Ginkgo biloba extract has been proven to increase blood flow to the brain. When a person is developing Alzheimer's Disease, taking ginkgo is a must. 100 to 200 milligrams three times a day is a reasonable dose. Eat protein-rich foods that are in balance with the rest of what you eat. Plenty of fiber is important and avoid alcohol, cigarette smoke (first or second-hand), processed foods, or direct contact with the metals aluminum or mercury. Avoid all products having aspartame (trade name NutraSweet) on the label. There are two diet soft drinks on the market today that do not have aspartame in them. Choose which support your dietary needs. These are Diet RC Cola, which contains no aspartame, no saccharine and is very low in sodium. it is sweetened with sucralose (trade name Splenda), a chlorinated sucrose derivative that is a non-nutritive sweetener. The other dietary drink on the market is Diet Rite. This contains two sweeteners, the same one that is used in RC Cola; the other is called acesulfame potassium. Diet Rite has no aspartame, no sodium, and no caffeine! Both of these soft drinks are made by the Royal Crown Cola Company. further research of the product Splenda is pending. Thus far, I have observed that those people I know that have switched from aspartame diet drinks to those with Splenda, have not exhibited any of the side effects attributed to aspartame. A cure of Alzheimer's Disease would most likely consist of reversing the process that contributes to the formation of the disease. It would then be necessary to have a cleansing process that allows for the reestablishment of brain and nerve conductivity. Any treatment would prevent or block the plaquing process. Some new research is being done with cell steams. This is looking at growing new nerve cells that have been totally damaged or destroyed. Most people who have this disease need to be monitored in case they are not able to remember to take medications or see their physicals. At this time there is no cure for Alzheimer's Disease, however this does not mean that there are not effective treatments. The Food and Drug Administration of the United States Government (FDA), has approved a drug called rivastigmine (Exelon) for treatment of this disease. It is a part of a class of drugs that are called cholinesterase inhibitors. These inhibitors, block the breakdown of a neurotransmitter called acetycholine. Acetylcholine is believed to play an important role in memory and cognition. Rivastigmine is the third drug that has been approved by the FDA which is involved with these inhibitors. The other two drugs which the FDA has approved of, are called donepezi (aricept) and tacrine (cognex). These two have also shown promise in inhibiting the breakdown of acetylcholine. Rivastigmine has side effects though, which should be monitored and carry a warning. It can cause vomiting and nausea serious enough to cause weight loss. Blood tests need to be taken constantly with taking these medications as some may cause inflammation of the liver. In these cases discontinuance of the drug ended the vomiting and nausea. More recently memantine (Namenda) has been approved for the treatment of moderate and severe Alzheimer's. Other drugs that maybe prescribed by doctors may include tranquilizers, anti-depressants and anti-psychotic medications. These may handle some behavioral problems for some patients. Some people may experience sleep disturbances, depression, anxiety, agitation, hallucinations or delusions. Be very careful with these kinds of prescriptions. Sometimes they are worse then having the disease. In some cases you end up with a non-responsive person. You will need all the patients help and assistance you can get. Many times you need them to tell you how they are feeling or what they do perceive and if they are not able to all those treating them are really at a loss. These drugs are not for every patient. They car worsen conditions for many. Only if patients have very upsetting conditions and they are out of control and might injure themselves or harm someone else. These are also administered in very low doses. Another, more natural, source that has been approved by the FDA is called Memorzine (Huperzine A, Hup A). It is prepared from club moss (Huperzia serrata). Memorzine is an alkaloid compound which enhances memory, focus and concentration. It works along the same ways in which the drug inhibitors do, inhibiting the breakdown of acetylcholine. Art Therapy is another way to assist Alzheimer patients to have a voice and remain active. It is a non-verbal approach to deal with emotions and feelings for the patient. The art therapist can allow free expression while targeting specific things to have the person express what they are feeling. This can be cathartic for some patients or even those close to them. Another very good therapy is Music Therapy where there is an effort for the person to become involved with how they feel. It allows them to sense through music and express through sounds, what is going on inside and get it out. The therapist can work with them to pin point what they would like to express and have them perform various tasks that can allow them to still feel a part of what is happening around them. Care givers have found that by changing an upset patients routine or surroundings they can calm them. The most important thing to remember is not to argue with the patient and stay calm and learn how to redirect their attention. All you have to say is "I'll help you." You do not have to argue with what they perceive is so. It has been proven that people with memory loss do better in calm environments. Many doctors advise patients to remain active and continue doing things they enjoy doing. Couples, friends and families can still enjoy doing things together. Attend adult centers. Encourage people to want to enjoy and smile and laugh. Let them take time to do what they can, because some people are aware of losing some of their memories. The Alzheimer's Association sponsors more then 1,500 support groups. You might want to find out which ones exist in your area and get involved. When you think of questions write them down and ask your Physician. About one third of the Patients that have this disease do not know they have it. Be aware that as a individuals with this disease will start to loss certain faculties so if being alone or driving a vehicle becomes an issue have their physician or nurse ask them to stop driving and be aware this can be tough. Research is still being done is this area. Researchers that are testing new medications do not want to work with just anyone. They can get the best results from those that can still respond and tell them how they feel so they can test for best effectiveness. They do not want patients with other conditions because it is had to tell what medication is affecting which condition. It is best to watch for new breakthroughs as they come up. Stay informed and find out as much as you can concerning your own condition or that of your friend or loved one. or visit Alzheimers.com here on the Web.